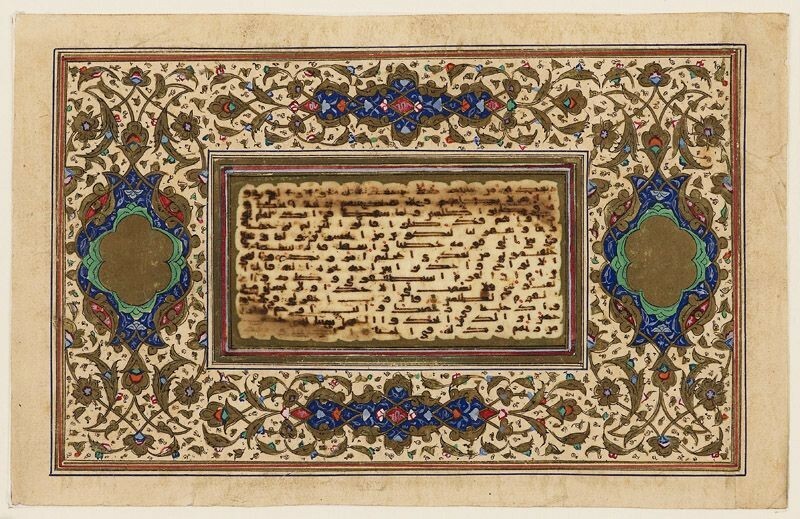 Ali, the cousin and son-in-law of the Prophet Muhammad and a master of kufic script according to tradition, exhorted to copy the Qur’an in large letters so that the majesty and dignity of God’s word could be aptly conveyed. 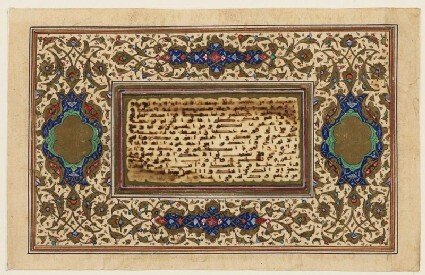 Yet, the fragment at the centre of this elaborate page (Qur’an, 23:94) demonstrates how small-scale copies of the text were also produced very early on. Miniature Qur’ans were essentially used as amulets, and carried in boxes or worn. 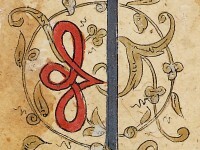 The illuminated margins were added at a later time, to preserve and bring value to the fragment. Presented by Dr John Pincent, in memory of Haim Nahmad, 1993.